The following information is taken from the AlGenWeb Archives by Darlene Campbell Scott. A restoration of this cemetery is in progress. 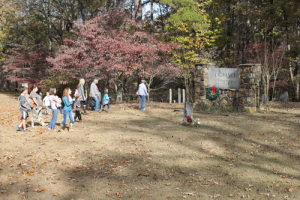 The LaGrange Cemetery is listed on the Alabama Historical Register of Landmarks, and bears the names of families who once lived on and around the mountain. 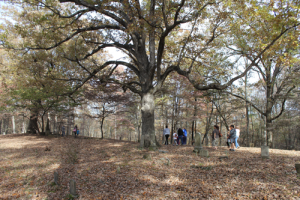 The LaGrange Antebellum Cemetery is located within walking distance of the LaGrange College Site Park. Of particular interest to visitors is the Abraham Ricks monument. Grafted by an Italian sculptor, it towers over the cemetery like a guardian angel. It was created on the mountain top from slabs of marble brought to the United States by the Ricks family, along with the sculptor himself. Over the years, many of the tombstones have been destroyed. The LaGrange Living Historical Association has worked to restore and preserve the heritage of their family members who have gone before them. Through their efforts, a piece of LaGrange stands the test of time and man. The continuing restoration and preservation work of the LaGrange Cemetery is an ongoing project by members of the LaGrange Living Historical Association. They are located at 1491 LaGrange College Road, P. O. Box 306, Leighton, Alabama. I transcribed this cemetery September 18, 2001 when I was on vacation in search for my own ancestors. I have many family members in this cemetery and I hope my information will be helpful to you. I will be adding pertinent genealogical information as notes. Many of the graves in LaGrange Cemetery no longer have markers. It is estimated that there are nearly 200 burial sites, the remainder unknown. Click below for an external link to the AlGenWeb Archives providing a name of those interned at the LaGrange Cemetery and photographs of each individual tombstone.